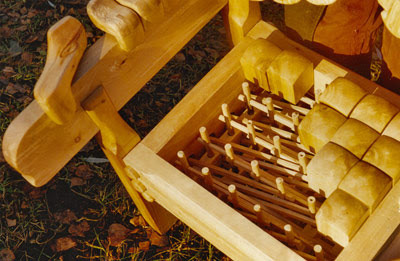 Is it possible to make a 100% wooden chair, which would still be soft as if it has a cushion? It turns out that yes, such a chair does exist – and it’s the only one. It has wooden springs and a splendid design, one of a kind. Some people say it reminds them of cymbals, the others compare it to a xylophone. This patented masterpiece was created more than 20 years by Igor Gerasimenko, a Professor of Design of Belarus State Academy of Arts and a PhD in Art. How come that he filed a patent for this model and never assigned it to anyone? What is the history of creation of this authentic chair? Where is the only existing piece stored? Let’s find it out from an interview with Igor. Please, Igor, tell us a few words about your patented chair model, its peculiarities and the history of creation. It’s all very simple. Back in 1980s I and my colleagues from the Academy of Arts were in charge of designing a recreational area on the shore of the biggest and most beautiful lake of Belarus – the Narach. And when you spend so much time dealing with folk architecture, furniture inevitably becomes another focus of your attention. As soon as we didn’t just draw sketches, but actually made versatile models of chairs, stools and arm-chairs, I came up with an idea to make something special, in country style. I thought that peasants didn’t use their plain furniture to the greatest extent. Then born was an idea of a soft and 100% wooden chair. 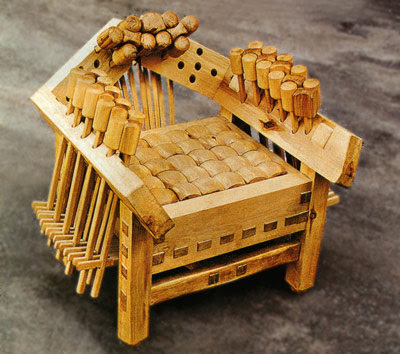 The seat had to be sprung with wooden rods. Rods – because one can’t make usual springs of wood – they’re made of steel. I spent a few months trying to figure out how to hide these rods inside the chair and at the same time make them as long as possible for the sake of durability. This was the biggest challenge and soon as I found the right technology, the chair was born. And it still exists, in one copy. And why is it the only one? Because it’s not my key activity. I just generated an idea in the course of my daily work and put it into practice. And there is one more peculiar thing about it. Standard steel springs are apt to metal fatigue, they keep springing and springing…. then gradually bend and lose their cushioning capacity. In my model you can remove all the rods, turn them upside down and fix back again. And it will serve like a new one. Why do you think the patent for this splendid chair appeared to be unclaimed? Firstly and mostly, because I didn’t make a single effort to make my model recognizable or famous. I just lack time for that. I’m busy with other tasks: I design cars and air planes, and the chair is my love. And as it usually happens, love gets sidelined by vanity of vanities. My packed schedule is probably the only reason. In fact the chair comprises of many repeated items, which makes mass production quite possible. And do you have this chair at home? Sure, I keep and use it in my house. It has already suffered a lot since then. Actually it has been over 20 years and even about 30 already! Didn’t you want to sell it? No, of course. I showed it a few times on different exhibitions, but the manufacturers of those times were concerned merely on simplicity of production process and instant revenues. And this chair is pretty special.